This villa has great kayak and snorkel access, and is close to some great restaurants. On the island, there’s horseback riding, jet skis, and every other adventure you could think of. With no shortage of activities and tons of space to spread out, your guests will have the vacation of a lifetime at Roi Soleil. Roi Soleil is set on two beachfront acres on the southern coast of Providenciales. This villa is a beach-lover’s paradise, thanks to the villa’s water sports equipment and secluded, seaside location. The wraparound staircase and flagstone walkway lead down to the pristine shore, where guests can kayak, paddle board, or snorkel on their own stretch of the sea. There are also beach umbrellas, beach toys, and life vests available for guests. Rinse off in one of two outdoor showers before taking a dip in the infinity pool or sunbathing in loungers on the coral stone deck above the beach. The deck comes alive at sunrise and sunset, with up close and personal ocean views that can’t be beat. Take full advantage of the sunsets while cooking on the grill, dining under the veranda, or sinking into the hot tub with a cocktail in hand. Inside, guests can enjoy movies from the villa’s DVD library on the flatscreen TV or catch up on family time over some board games by the large bay windows. Roi Soleil has two fully-equipped kitchens, one in the Main House and one in the Guest House. The Guest House also has its own living area similar to the Main House’s. The Main House’s air-conditioned bedrooms are split up between the upper and main levels. The main level suite has a queen bed, a 42” LCD TV, an ensuite bathroom, and exterior access to the terrace. The upper level holds the master suite and a twin suite. The master suite has a king bed, a 42” LCD TV, an ensuite bathroom, and access to a private balcony. The twin suite has two beds that can be made up as a king, a 42” LCD TV, access to the balcony, and shares a bathroom with the common area. In the Guest House, there’s a queen suite with a 42” LCD TV, exterior access, and an ensuite bathroom. The Guest House’s living area has a queen sofa bed as well. With four bedrooms, beach access, and an independent Guest House, Roi Soleil would be an ideal choice for a large family or for a couples vacation. 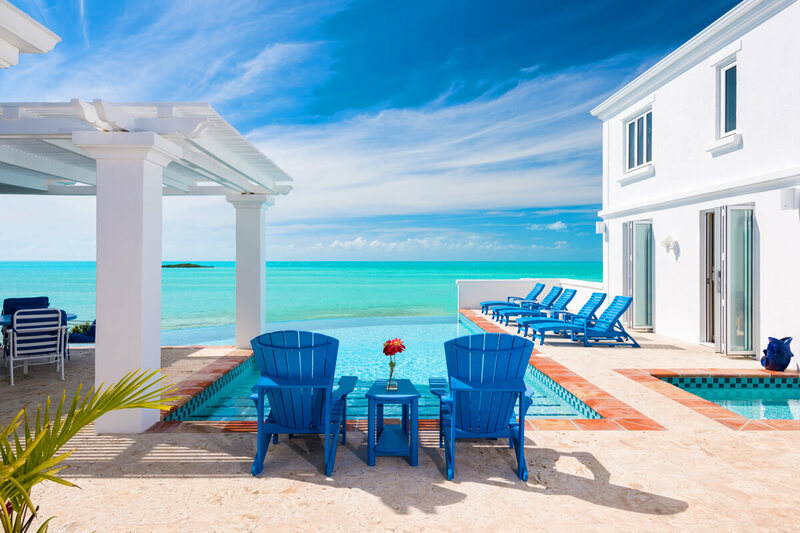 Electric gates and security cameras guarantee guests’ privacy and security while relaxing on Turks and Caicos’ most popular island. Large infinity edge pool as well as a small, shallow children's pool with a waterfall. Over 200 feet of villa owned and tended beachfront. Upon arrival guests will be met by a member of the villa management team. After securing their rental vehicle they will follow them back to the villa. You are given 350 KWHR per week for A/C allowance. Any A/C overage is additional. With special permission the villa can accommodate up to 10 with the use of the guest house sofa-bed, which is equipped with a Queen deep pocket mattress. For occupancy of 9 or 10, an extra weekly charge of $700 plus island tax will apply. More than 10 are not permitted. Car rental, private chef, butler, server, daily maid service, grocery and beverage shopping (pre-arrival and during your stay), liquor and wine delivery, nanny service, baby equipment, spa services, yoga and personal training, photography, and private airport transfer/car service can be arranged for an additional fee.